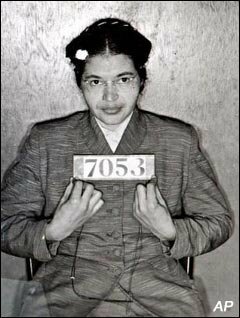 Rosa Parks is a true profile in courage. And it's worth recalling the circumstances: her courage, her choice, came not in some spectacular moment, but in an exceedingly ordinary moment. It might well have passed. How easily one could could let it pass. But for the ennoblement of our nation, she did not let it pass. Call it grace, call it providence, call it what you like -- but something inspired her to act at that moment, and it changed everything. This is how most of us will be presented with opportunities for virtue and our own ennoblement, and opportunities to make others, our world, better: seldom in obvious, climactic moments; more often in tedious, beige-colored instances where we don't feel very heroic; we may not even realize or intend anything particularly brave or virtuous; we simply act out of the store of who we are: and we become a little more who we are meant to be. May her soul, and the souls of all the faithful departed, rest in peace. Yes, this is precisely the point. Her moment of courage changed her, and our nation, forever. Would that we all responded to grace in this way.